This weekends campcraft course is all about working with natural materials and learning the skills required to construct a number of craft items from the surrounding woodland. After an initial induction into the woodland tools that you will be using during the weekend, you will be tasked to firstly harvest the materials and then construct a range of tables, benches and beds from hazel, you’ll be show how to utilise natural cordage and construct various types of pot hangers, utensils as well as other cooking aids. This course will give you a broad range of practical skills and knowledge enabling you to setup a basecamp with home comforts using your campcraft skills. This course is run from our Wiltshire and Gloucestershire sites. Full details of how to get to the site will be provided once you have booked. All meals for this course will be provided, allowing each student the opportunity to do some bushcraft cooking over an open fire. We have a kettle always on the go so you can help yourself to tea, coffee, squash and biscuits. We also have fresh drinking water and a fruit bowl available. We would advise that this course is suitable for 16 years old and upwards, under 18’s must be accompanied by a paying adult. A kit list for the day can be found here, we will also send this to you once you have booked. “It was a really good day for me. I learn’t a lot. Friendly and relaxed atmosphere”. “Hi Adam and Ellie, Thank you for a fantastic day. We both thoroughly enjoyed weaving our baskets, even if mine is a little wonky (or how you put it hand made). “Freindly and relaxed learning environment”. “Adam and Ellie have a true passion for bushcraft, thanks for a brilliant course, oh and the pigeon was fantastic too. “Wow what a fantastic course, I really enjoyed myself. Thanks. “A day spent in the woods, learning new skills, fantastic!”. “Can’t wait to get out again and pratice my newly learn’t skills”. “Excellent fun, lots of ‘hands on’ and a really good knowledge base, Thanks. “I thoroughly enjoyed the Hands on bushcraft butchery day, there are not many people who do this in the UK and I was pleased that the tuition was excellent, facilities good and plenty of hands on butchery to really master the techniques”. “Just wanted to say thanks Adam and Ellie for a great day today. I will be recommending your courses far and wide – I thoroughly enjoyed it!”. “Fantastic Experience – I’d highly recommend this to anyone who’s keen for an outdoor experience. Our guides Adam and Ellie were extremely knowledgable, patient and most importantly a lot of fun to be around. Overall it was a brilliant trip and I’ve got a lot great memories from it”. 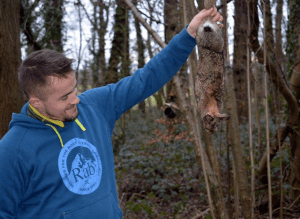 “Fantastic Stag Weekend, I organised a stag weekend in the ‘wild’ for a small group of us and I can say that it thoroughly hit the mark. Adam and Ellie were great guides and hosts, joining in with banter and also leaving us to ourselves with just the right balance. We learned to strip down a pigeon and a rabbit with our bare hands, build fire from scratch, and spent a night under the stars in our self-constructed woodland castle. Passing a bottle round the fire and feeling unjustifiably proud of our newfound man-skills was the perfect alternative stag do. Full marks all round – I would thoroughly recommend this to other like-minded groups”. “Just spent a fantastic day with Adam and Ellie on one of their courses at Swindon. Both of us really enjoyed the day and learn lots of new skills. There was areally friendly and helpful atmosphere and lots of real hands on experiences with shelter building, fire lighting, food preparation and more. We would thoroughly recommend this course to anyone who enjoys the outdoors – well run and very helpful and friendly”. “Great communication by by Adam and Elly. The travel instructions where perfect. The hospitality was great. Warmly welcomed and given a clear run through of the days activities. It became very clear that Adam and Elly are very passionate about providing a professional service. Their knowledge is fantastic, and they know how to look after their clients. The day began with a really interesting forage. It was really great looking at loads of plants & berries finding out about healing properties, etc and learning so much about trees wood and the natural world around. Eventually we went back to base camp which was fantastic. We prepared pigeon and all the berries and fungi. Wow. What a feast.! A great day out, but weekends are also available. A must for anyone who wants to learn about real food, and so much more. thanks for a great day. Check out the website for loads more details. I loved it”. “Great Fun Day , very informative and the pigeon lunch was fantastic. Give it a go, still smelling of smoke after lighting fires with a couple of sticks ;-)) , great present . Thank you”. 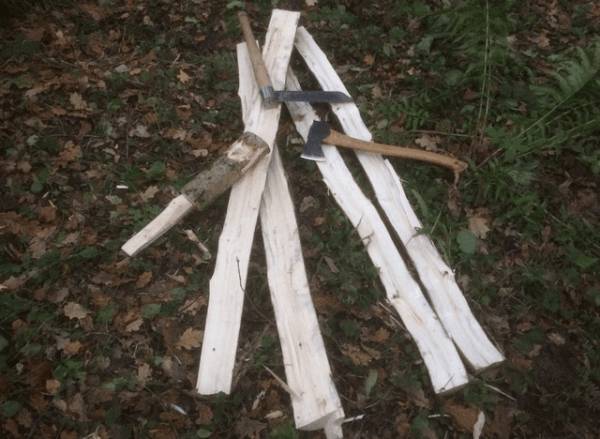 This weekends campcraft course is all about working with natural materials and learning the skills required to construct a number of craft items from the surrounding woodland. After an initial induction into the woodland tools that you will be using during the weekend, you will be tasked to firstly harvest the materials and then construct a range of tables, benches and beds from hazel, you’ll be shown how to utilise natural cordage and construct various types of pot hangers, utensils as well as other cooking aids. This course will give you a broad range of practical skills and knowledge enabling you to setup a basecamp with home comforts using your campcraft skills. Our instructor will take you out into the woodland and talk you through the selection process of coppicing. You will guided through the safety aspects of coppicing the hazel shrub using saws and axes. To collect the useable you’ll have to prune and de-limb the various branches and the off cuts will be used later on in the weekend. 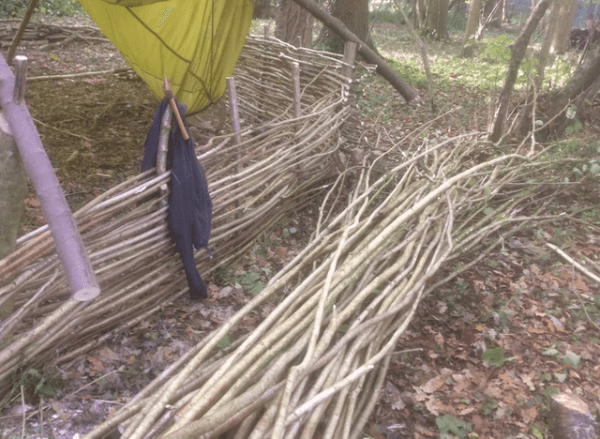 Once you have transported the coppiced hazel rods back to the basecamp area our instructors will then guide you through how to split the hazel down lengthways using a traditional froe as well as improvising and using a knife or axe. 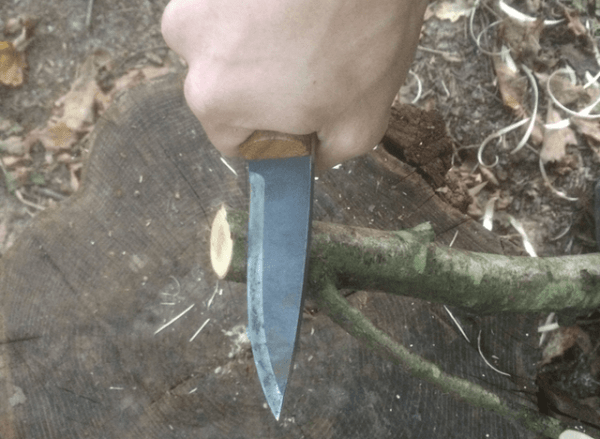 You’ll be shown how to improvise a drawknife from you bushcraft knife an d use it to shave the hazel rods down to the desired thickness. Our instructors will also guide you through how to make some splitting wedges to aid you whilst you split your pieces of timber. Our instructors will then guide you through how to build benches and tables from the materials. You will be constructing a number of pots hangers from the harvested hazel too. From the left over materials you will carve a number of useful utensils from spoons to spatulas, tongs to pot hooks and everything in between. Our instructors will also guide you through sourcing and unitising natural cordage within this campcraft weekend from making withies to digging up roots. Spend another weekend with us on our Bow making course. A 24hr bushcraft course is designed to give you an overnight bushcraft experience, putting your skills to the test under the guidance of our skilled instructor team. 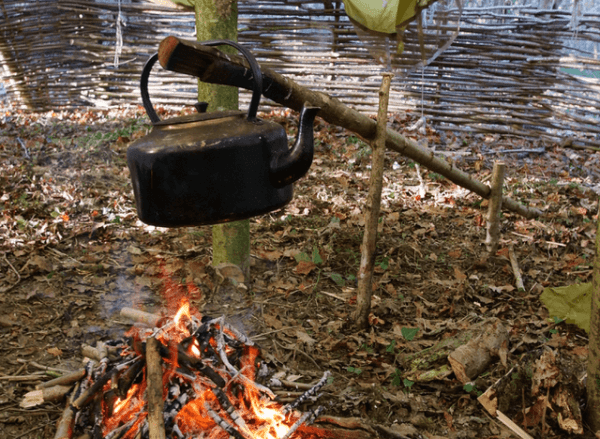 You will learn how to construct a weatherproof debris shelter alongside how to create fire with matches using the bow drill method (fire by friction). You will guided through how to prepare a pigeon for your lunch and a rabbit for your evening meal alongside cooking techniques. Snares and traps is another skill that we teach you including the legalities. Spend the weekend in the woods splitting, cleaving, and carving your very own flat bow from locally sourced Ash from our woodland. 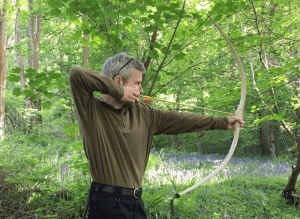 During the weekend you will learn how to make a bow from a piece of timber and gradually carve it down to the desired bow shape before testing how well it shoots on the final day. 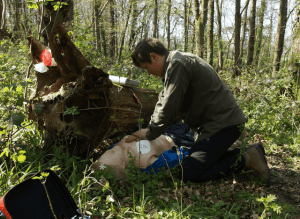 Wilderness First Aid course Level 3. A 16hr first aid training course where you will gain a nationally recognised qualification. This course fulfils the requirements for mountain leader training (ML) and BCU amongst others. 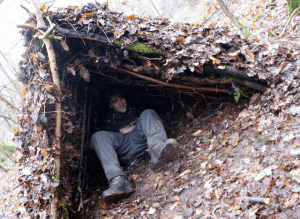 The Bushcraft Weekend is a three day course designed to build on the essential bushcraft skills including fire by friction, game preparation and water sourcing. You will be learning how to identify various trees and pants and get hands on with producing some natural cordage as well and looking at their other uses. 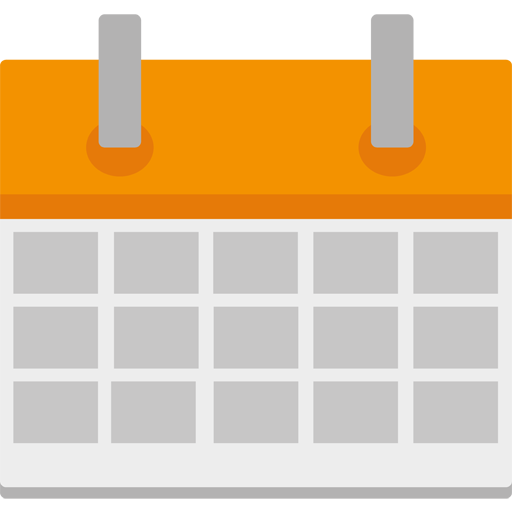 See what courses are coming up and book your next adventure now.